A value chain cannot go on infinitely. A person must have some ultimate value that serves to justify and motivate the others. 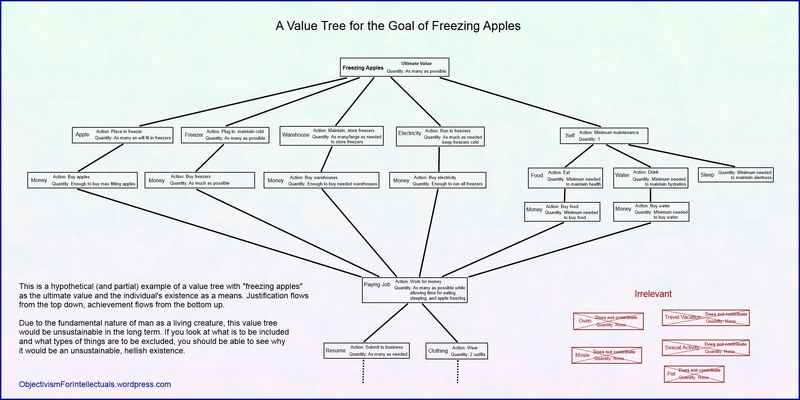 A set of value chains that converge on a single ultimate value may be termed a “value tree.” The ultimate value is an end-in-itself that is never pursued primarily as a means to something else. An example of a hypothetical value tree. This tree would be possible for someone to attempt, but would be unsustainable. Click to enlarge. So the question I will answer is: Can a person be committed to more than one separate value tree, each leading to a separate ultimate value? Having two different value trees means that two different sets of actions are required to achieve each ultimate value. The actions required to achieve one will continually conflict with the actions required to achieve the other. Thus, a choice will be required to select only one of the two appropriate actions at a given time. As one obvious example, consider a man who has Ultimate Value 1 (UV1) as “freeze apples” and Ultimate Value 2 (UV2) as “bake cakes.” He has just obtained eight hundred dollars. He owns neither a freezer nor an oven. If he wants to pursue UV1, he should buy a freezer. If he wants to pursue UV2, he should buy an oven. How is he to decide where to spend his money? The way one decides with a single ultimate value is by determining which option better promotes that ultimate value in the current situation. But with two distinct ultimate values, there is no way to decide rationally. The man making the choice might as well flip a coin. There is no rational way to decide which ultimate value to pursue at any given time. Having an ultimate value means that every decision should be weighed by how much it contributes to that ultimate value. It means that the person should plan in advance for how best to achieve as much of the value as possible. It means ruthlessly cutting out any value that is not a part of that particular value tree, because only values that serve the ultimate value are justified. In the case of UV1, this means freezing as many apples as possible while one is alive. For UV2, this means baking as many cakes as possible. But if a man holds these two “ultimate” values, then he cannot plan in advance how to achieve either one to the best of his ability. There are necessarily many situations where he does not act to gain and/or keep each of the purported ultimate values. The very fact that there are two “ultimate” values means that they violate and contradict each other. So, in a very real sense, he does not actually value either of the “ultimate values” as ultimate values. Therefore, having two ultimate values is, in a strict sense, self-contradictory and impossible. More realistic examples of attempts to posit more than one ultimate value will be discussed in upcoming articles. One article will deal with one’s own life versus socialization as ultimate values (Link) and another will discuss an example of life vs. flute playing. I also recommend Viable Values: A Study of Life as the Root and Reward of Morality and Ayn Rand’s Normative Ethics: The Virtuous Egoist by Tara Smith. This entry was posted in Ethics, Human Nature and tagged atheism, Ayn Rand, college, evolution, liberty, Objectivism, philosophy, religion, university, values by Sword of Apollo. Bookmark the permalink.